Why put off to tomorrow what you should do today … especially if it can be a lifesaver for your pet bird? Here are five choices to make now to better your bird’s health. 1. Choose an avian veterinarian and schedule an appointment. Establish contact with an avian veterinarian before you find yourself in dire need of one. Unfortunately, some pet owners are forced to frantically search the Internet or phone book for a veterinarian because their pet became sick or injured. The danger with this is multi-fold; in the case of an emergency, precious time can be wasted not only in trying to find the phone number for a veterinarian, but searching for the physical address of a clinic you’ve never been to. In this harried approach, you also run the risk of bringing your bird to a veterinarian who little to no experience treating birds. Many of us take the time to find a doctor we trust and like; it should be no different when it comes to our pet birds. Save yourself a headache — and possible heartbreak — by researching a few veterinarians in your area and choosing the one who best meets your needs (ex. location, hours, avian experience, “bed-side manners, etc.). The next step is to take your bird to your chosen vet for a well-bird exam. 2. Choose to keep your bird up-to-date on diagnostic tests. If you are traveling at all in the year ahead and plan on having your bird stay at a pet boarding facility while you are away, you don’t want your reservation to be denied because you neglected to keep your bird up-to-date on its annual diagnostic tests. Most pet boarding facilities that accept avian clients require a health certificate from a veterinarian stating that your bird has been tested for, and is free of avian diseases such as Proventricular Dilitation Disease (PDD), psittacosis and Beak and Feather Disease (PBFD). If you plan on taking your bird along with you on your travels, especially if you are going out of state or taking your bird on a airplane flying, you might need a certificate of health from your veterinarian within 30 days or less prior to your departure date. 3. Choose to pay attention to your bird’s poop — no joke! Kudos to you if you make an effort to change your bird’s cage liner every day, but before you “roll and throw,” pause to see what your bird’s gastrointestinal tract has been up to. You don’t need a crime-scene-style investigative kit to do this, you just need a general idea of what constitutes a normal dropping for your bird. The next time you bring your bird to the vet, take along the dirty liner from your bird’s cage. (Don’t tightly roll up the liner, which can smear the droppings. Instead, slide it loosely into a grocery store bag for easy transport) and ask your vet to show you what makes up the droppings. Interestingly, some foods can influence the dropping’s color. Birds that eat mostly seeds usually have green-colored droppings, while those on a mostly pelleted diet have brown-colored droppings. Certain fruits can also influence the color of your bird’s feces .. a few fresh blueberries, for example, can color the feces purple! 4. Choose to stash some cash for your bird. Create a healthcare savings account for your pet bird, and contribute to it each month for your bird’s healthcare needs. Adding $10 or $20 a month can help you budget for your bird’s routine exams and potentially ease the sting of an unexpected medical treatment. Also, consider buying pet health insurance for your pet bird. Shop around for the coverage that best meets your needs; ask what procedures are covered on the plan and what the deductible will be for your pet bird, as the price can vary depending on your bird’s age and species. 5. Choose to weigh your bird regularly. Instead of guessing your bird’s weight by how much heavier or lighter your bird seems when perched in your hand, it’s time to taking guessing out of the equation. 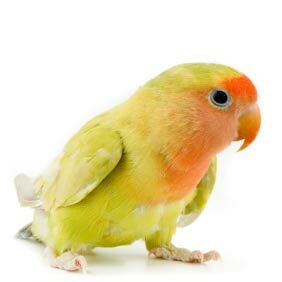 Purchase a scale that weighs in grams (not ounces) and do a weekly weigh-in of your pet bird. Weight ranges vary depending on the bird species, so ask your avian veterinarian for your bird’s ideal weight range. Report any fluctuations outside of your bird’s established weight range to your avian veterinarian, as this can be a sign of ill health. A gram scale can also be helpful if you are converting your bird to a healthier diet. Some birds can take a while before trying a new food, which is why many aviculturists recommend continuing to offer the old diet along with the new offering until the bird consistently eats the new diet; essentially you are weaning your bird off its former diet and onto a new one. Regular weigh-ins can help you monitor your bird’s weight to make sure it is not losing weight during this transition.